What’s the deal with downtown and parking? If you listen to some people, then downtown Spokane’s mostly paid parking causes all sorts of problems for downtown. The theory goes that a large number of people simply refuse to shop or work or locate businesses downtown because they don’t want to worry about finding a space and paying for parking. While we’ve already shown that downtown already has too much parking, the cost issue may or may not be a fair concern. Most other downtown areas nearby (i.e. Coeur d’Alene, Sandpoint, Missoula, etc.) don’t charge for on-street parking, and often even off-street parking is free (i.e. Coeur d’Alene’s McEuen Park, which offers two hours of free parking). But is it a fair criticism? You’re never too far from a metered space in downtown Spokane, and if you park near Kendall Yards, you can get free parking and a beautiful five-minute walk. If you’re looking at off-street parking, our rates are comparatively a steal. In Seattle, or Portland, or San Francisco, or San Jose, or Los Angeles, you’d be paying at least $15 for a two- or three-hour shopping trip. Here, $5-8 probably is the most you would pay. So why do people here freak out over the very thought of paying a small amount of money to park? Or at the thought of finding a place to park, when we have a great overabundance of parking as it is? We think that three potential solutions could get more and more people downtown. Any of these three, or a combination, could make a big difference in combatting the negative perception that many Spokanites hold about shopping or working downtown. 1. Create a downtown “parking authority.” Under this scenario, all surface parking and street parking in downtown Spokane would fall under one management structure. The parking authority would be responsible for price setting, enforcement, and the creation of a common marketing scheme. 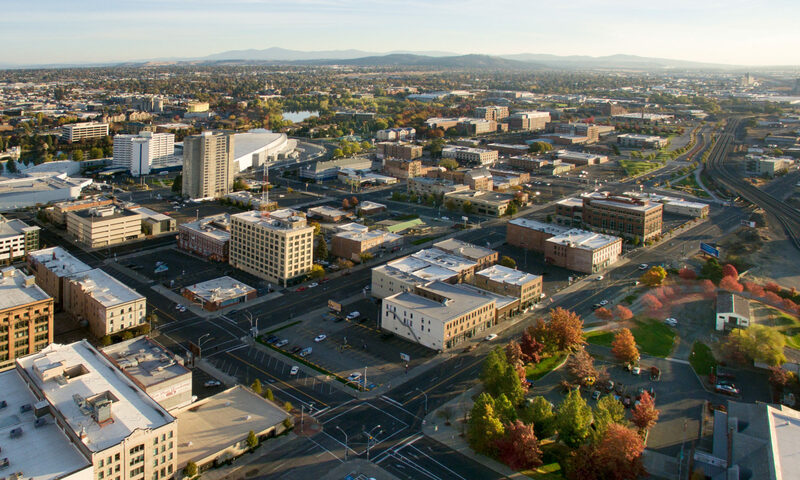 No longer would you worry about whether you are in a City of Spokane, River Park Square, Diamond Parking, Convention Center, or Davenport spot. You’re just in a Spokane spot. Less worries. More convenience. 2. Through strong planning and capital investment, encourage more people to use transit to come downtown. This is a touchy subject as it is, but the fact remains that if you don’t use a car, you don’t even have to worry about parking. Let’s make transit even more convenient than driving. Let’s build out a streetcar, a trolleybus, a light rail. Let’s make bus service more efficient, more predictable, more frequent. Let’s build “stations,” with bulb-outs, highly-designed shelters, and ticket vending machines for off-vehicle ticketing. Currently, “choice” riders avoid STA because it lacks a critical experiential element. Make it more of an “experience,” and perhaps more users will ride downtown. 3. Make it free. Yup. I went there. If both other options were employed to reduce the number of parking spaces demanded, perhaps we could get rid of the meters entirely. It’s not like they provide a massive revenue stream for the City. Those funds could easily be replaced with small adjustments in other areas of the budget. And the vitality effect could be huge as individuals make more excuses to shop downtown. Besides, the positive publicity associated with free parking could be reason alone. Let’s go for it. What do you think? With a historic parking surplus and significantly lower parking costs than other areas of the country, why are people so paranoid about what seems to amount to a relatively minor issue? Does parking stop you from shopping or working downtown? Do you think free parking or an investment in transit could make a difference? What of the parking authority idea? Share your thoughts on Facebook, on Twitter, in the comments below, or in person. We love to hear from you.